iOS's Do Not Disturb feature can do more than merely silence incoming calls while you sleep. Here's what else it can do for you. Our smartphones have the tendency to ring or buzz at the most inopportune time—in meetings, at movies, while we’re just trying to get some #$%& sleep oh please stop buzzing it’s three in the morning! Does this sound familiar? Of course it does. But iOS’s Do Not Disturb feature can help you rest a little easier. Do Not Disturb effectively silences almost all notifications while you aren’t actively using your phone. You can set it so your phone won’t ring or buzz when you receive phone calls, new text messages, new email, or new invitations from annoying “friends” who want to challenge you to a game of Candy Crush or whatever. Certain notifications get through no matter what, such as timers and alarms set through the Clock app. You may still receive various government alerts too, such as emergency alerts and AMBER alerts. But as we’ll see, you can customize Do Not Disturb so it works better for you. In case you’re new to iOS—or just haven’t poked around your phone that much—here’s how to switch off and on Do Not Disturb manually. The easiest way to toggle Do Not Disturb on or off is to go through Control Center: Swipe up from the bottom of the screen and tap the Do Not Disturb button, as denoted by a crescent-moon icon. The button will turn white when Do Not Disturb is on, and become translucent gray when it’s switched off. You can also turn it on through the Settings app if you’re so inclined: Go to Settings > Do Not Disturb and slide the Manual toggle on or off. In addition to manually switching Do Not Disturb on or off, you can also set it to kick in automatically during a specific time period. Using quiet hours lets you silence your phone at night, for example, and not have to worry about toggling the feature off the next day. But you can set quiet hours to kick in at any time. Do Not Disturb’s Quiet Hours will help you get a good night’s sleep while ensuring you don’t miss important calls during the day. Go to Settings > Do Not Disturb (if you aren’t there already), then tap the Scheduled toggle so it’s in the “on” position (it’ll turn green). 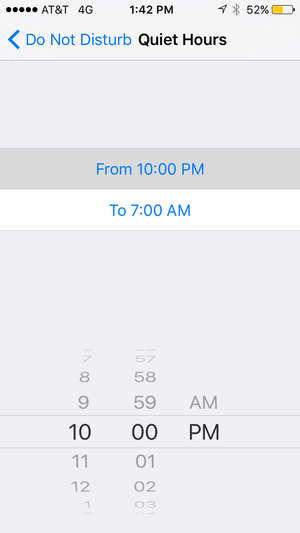 Next, tap the From/To list item that appears, then use the time picker to set a new start and end time. Hit the Back button in the upper left corner to save your settings and return to the previous screen. Do Not Disturb will silence all phone calls by default, but you might want your phone to ring when certain important people call, like your kids or your spouse. Go to Settings > Do Not Disturb > All Calls From to choose which contacts you want to let through. You can allow calls from those on your Favorites list ring, for example, or pick from Contacts groups. You can choose to allow calls from certain groups or people through at all times. To add someone to your Favorites list, open the Phone app or Contacts app, tap Favorites in the bottom toolbar, hit the “+” button in the upper right corner, then pick a person to add from your contacts list. If someone calls you twice in rapid succession, there’s a decent change that the other person really, really needs to contact you. 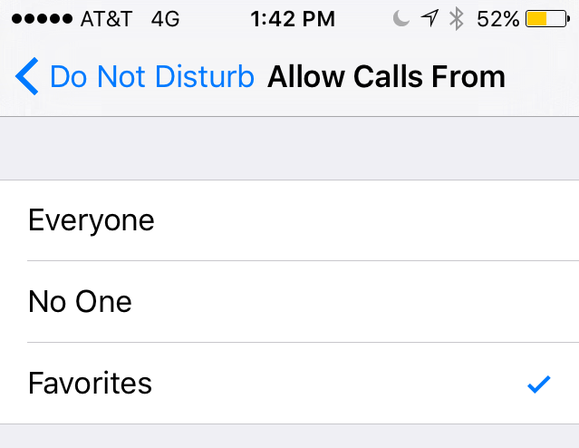 For this reason, iOS’s Do Not Disturb includes a feature that will let a call through if a particular person calls you twice within three minutes. 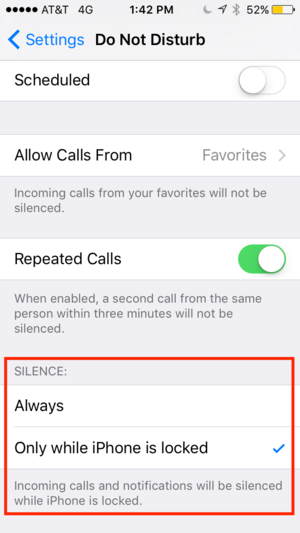 Go to Settings > Do Not Disturb and switch on Repeated Calls if it isn’t already enabled. If you want, you can keep all notifications silent at all time, or only when your phone is locked. By default, iOS’s Do Not Disturb will silence notifications only when your phone is locked—when you’re actively using it, you’ll receive notifications as usual. You can easily toggle this setting so that all notifications get silenced at all times. From Settings > Do Not Disturb, scroll down to the Silence section then tap Always. As usual, certain notifications, such as alarms, timers, and government alerts, will sound no matter what. Now, if you really don’t want to receive government-provided emergency notifications and AMBER alerts, you can disable them. Go to Settings > Notifications, then scroll down to the Government Alerts section and switch the two toggles to the “Off” position. When you do, you’ll get a little added peace, but consider the negatives: You won’t receive important emergency information, nor will you receive notifications of child abductions—high-risk situations during which every pair of eyeballs can help. Besides, these alerts go off so infrequently that leaving them on barely registers as an inconvenience. As powerful as iOS’s Do Not Disturb feature is, it could stand to borrow a few features from Android’s Do Not Disturb functionality. For instance, on Android, you can create “rules” that give you more flexibility for setting quiet hours, so you can set Do No Disturb to kick in during meetings or have different quiet hours on weekends. It also gives you some more options in terms of the sorts of notifications that can bypass your Do Not Disturb settings. 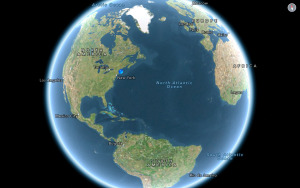 We look forward to see if future versions of iOS will bring improvements to these areas.